The National Association of Social Workers, North Carolina Chapter (NASW-NC) represented patient advocates in Washington, D.C. at the “We Work for Health Second Annual Co-Chair Summit.” We Work for Health, a grassroots initiative, is a coalition of advocates for biopharmaceutical research and medical innovation that advance health initiatives to improve the lives of patients in the country. NASW-NC became engaged with We Work for Health in 2009 on issues such as access to mental health medication and medical innovation as our state is a hub for biopharmaceutical research. After a full day conference, attendees participated in a reception attended by U.S. Congressional staff members followed by a dinner and awards ceremony. 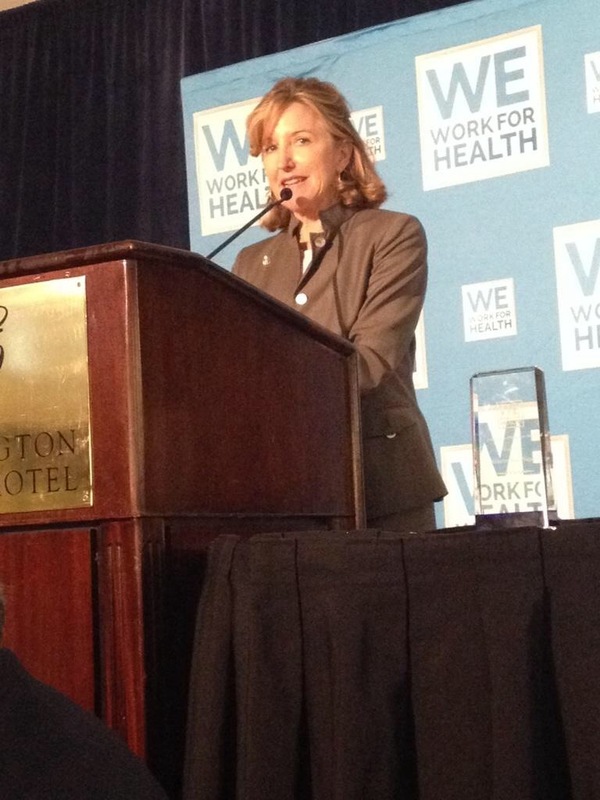 Senator Kay Hagan (NC) was awarded the 2014 We Work for Health Legislative Champion Award for her support of medical innovations. In her acceptance speech, Senator Hagan specifically mentioned the impact medical innovation and broad access has had for mental health patients in North Carolina. As a patient advocate representative, NASW-NC participated in meetings with the We Work for Health NC consultant, Randolph Cloud and NC Biosciences Organization (NCBIO) representative Laura Gunter. Meetings were scheduled with the staff of North Carolina Senators Hagan and Burr, North Carolina Congressmen Hudson and Butterfield and Congresswoman Ellmers to discuss the importance of funding for medical innovations and the positive outcomes for North Carolinians. The outcomes of research and innovation help North Carolinians obtain better lives as they fight diabetes, various forms of cancer, HIV/AIDS, and other diseases. The research done in our state helps our patients live better lives and has a direct, positive impact on our economy. There is a huge need for medical innovation to continue in order to find new and better treatment for diseases. Not only is innovation a priority, but for the many North Carolinians fighting diseases in our state, broad access to affordable medication is important for improving their lives and ensuring they have the best outcomes. For more information about We Work for Health and the work being done, visit www.weworkforhealth.org. This entry was posted on July 22, 2014 by naswnc in Advocacy and tagged Advocacy, Congressman Butterfield, Congressman Hudson, Congresswoman Ellmers, health, macro social work, Patient Advocacy, Public Health, Senator Burr, Senator Hagan, social workers, We Work for Health, We Work for Health NC.